Discovery remains on track for her February 12 launch, pending the successful replacement, testing and flight rationale for the spare three Flow Control Valves (FCVs), due to arrive at the Kennedy Space Center on Wednesday. Discovery is ready to accept the valves, as the vehicle continues the process of closeouts for flight. The pad flow at 39A remains on the timeline, as the vehicle continues to press through the various closeouts and L-15 day (to launch) processes. In tandem, waves of tankers are arriving at the pad to replenish the giant storage tanks with LH2 and LOX, which will be tanked into the External Tank ahead of launch. “S1287 Orbiter Aft Closeout: Orbiter aft confidence tests are complete less APU (Auxiliary Power Unit), which will be performed today after engineering data review,” noted Wednesday processing information on L2. “Aft Avionics bay and MPS/SSME (Main Propulsion System/Space Shuttle Main Engine) closeouts will be worked today. “PLBD (Payload Bay Doors) closed for flight last week. Also completed hyperload on Saturday. L-15 water sample is complete. Preps for EMU (EVA Mobility Units) functional are complete; testing is work this morning. Wednesday also marks the arrival of the three FCVs from the manufacturer Vacco, several days ahead of the “deadline” to make the February 12 launch date – though the main constraint remains flight rationale. “GH2 flow control valves are expected to arrive to KSC today. The team is awaiting OPO (Orbiter Project Office) approval to install the vales into the orbiter (expected to start Monday),” added Wednesday processing information. As previous reported, the issue with the FCVs relates to an incident with one of Endeavour’s valves during STS-126’s ascent last year. While the shuttle was not in any danger, post flight reviews evaluated the worst case scenario relating to a more severe issue with the valves, which included the “potential” of the failure causing the External Tank to vent beyond limits – deemed a Crit. 1 failure, or a LOV/C (Loss Of Vehicle/Crew) threat. 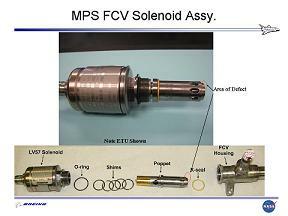 The role of the three FCV’s relates to the Main Propulsion System (MPS) and the SSMEs (Space Shuttle Main Engines) during thrusting periods. In each SSME, gaseous hydrogen from the low-pressure fuel turbopump is directed through two check valves to two orifices and a flow control valve for each engine. If the tank pressure is greater than 35 psia, the pressure is relieved through the liquid hydrogen tank’s vent and relief valve. If the pressure falls below 32 psia, the LH 2 ullage press switch on panel R2 is positioned from auto to open , which will cause all three flow control valves to go to full open and remain in the full-open position. During STS-126’s second stage flight, engineers noticed an uncommanded drop in SSME #2 hydrogen outlet pressure. The data indicated FCV #2 opened without removal of close command, which was an anomaly. Endeavour’s performance was not compromised thanks to Valves #1 and #3 compensating, and she achieved a nominal MECO (Main Engine Cut Off). As soon as Endeavour returned back to KSC – following a ferry trip back from her Californian landing – engineers removed the FCVs from the vehicle as a priority processing item, and sent them off to Vacco for examination. USA Logistics added that the three valves arriving at KSC today – a day ahead of their schedule – will be a mix of three reassembled valves that have come directly from Vacco. With the FCV issue likely to be removed as the single constraint to launch for STS-119, the Orbiter Project praised the extensive amount of teamwork undertaken by the NASA and contractor teams in working the problem – and gave an indication as to exactly how much work has been involved. “On FCV, have many activities ongoing. Have been very sensitive to team in terms of workload; tried to give people rest where think may have overtaxed people. Most work now is ongoing at Vacco in terms of getting valves reassembled and with the MSFC (Marshall Space Flight Center) Engineering team in terms of analysis/modal analysis. “Have also pulled in research centers at Ames and Glenn to help with analysis to try and not overload MSFC team. Have outstanding support from other centers in resolving this. White Sands has worked toward restoring their capability to do FCV testing. Think they may be able to get into a test as early as next week. Other pre-launch resolution work taking place includes the completion of modifications to the SRB (Solid Rocket Booster) Holddown Post Debris Containment System (DCS) and work on the T-0 Umbilical Plates in the TSM (Tail Service Mast) on Pad 39A to mitigate ice build up on the vehicle. Articles will follow over the next few days.